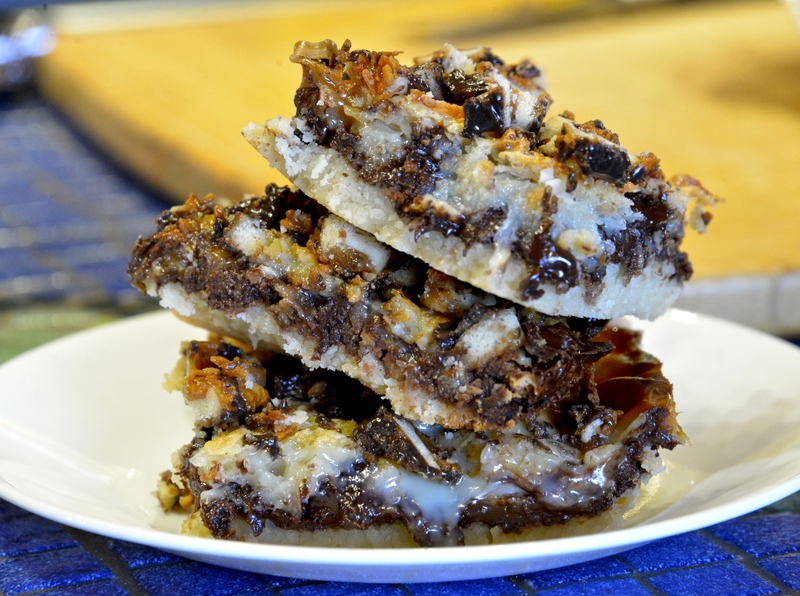 Samoa Girl Scout Cookie Magic Bars! Last week was awesome for this Oregon gal, she got to go up to a beautiful ranch in British Columbia and stay for a whole week, and bake her heart away. In my family of six, there are 4 girls and only 2 boys, we out number them two to one. Imagine how many times we have to stop for potty breaks on the 12 hour drive from our home to the Ranch? Probably every two hours. If we’re lucky. The thing is once we stop, we usually need provisions, like say more coffee! We love our coffee, and after we finish our coffee, what do we do? Head back to the washroom yet again, but it’s all good. We have fun, and we enjoy each other’s company, in the end, thats what it’s all about anyway. Mid rest stop about 6 hours into our journey, we came across some little girl scouts selling their famous cookies. There was probably 5 or 6 girls singing songs from Frozen, (Which you must know, is officially my new favorite Disney movie) and they were just too cute, we had to buy from them. Separately both my parents stopped at their table. My dad bought one box, and my mom came back with 5. She told us they gave her a deal. It turns out, the prices were 1 box for $4, or 5 boxes for $20…..I love my mother. 🙂 In any case, it was okay, because now, I had something to fuel my baking addiction! So ladies and gentleman I know introduce you to, Somoa Magic Bars! This is the beautiful Firlands Ranch where we stayed!